This five piece beat ensemble first came together while the original members were all still at St. Albans Grammar School. After winning a local talent competition they were given an opportunity to record by Decca. Their first single, penned by keyboardist Argent, was an immediate hit although it never quite reached the top ten in the UK. A number of superbly crafted singles followed- mostly written by Rod Argent or bassist Chris White. Surprisingly, none of these was to rise higher than #42 on their home ground. The frustrated Zombies fared rather better in the US, doubtless buoyed up by the 'British invasion' which was then at its peak. Nevertheless, this success quickly faded too and the underrated combo broke up at the end of 1967. They enjoyed one further chart entry during 1969 with the brilliant 'Time Of The Season' which gave them the biggest hit of their career reaching #3 in the USA. Sadly, it did little to raise the level of appreciation shown by British record buyers and no further singles releases ensued. Pictured left is the extraordinarily rare Zombies EP from 1965 (DFE 8598). As it didn't sell too well when it was first released, collectors of Zombies material have to be prepared to considerably lighten their wallets to obtain a copy nowadays. Rod Argent and Hugh Grundy set about the formation of a new group based around the musical talents of the brilliant keyboardist and appropriately named 'Argent'. Colin Blunstone decided to try his luck as a solo vocalist. After a slow start- all achieved a level of success during the 1970s and their Zombies output has become quite sought after- particularly the later, uncharted singles. Rod Argent's 'She's Not There' has proved a popular number with other artists and it has been remade on several occasions- most notable is the version by the American group 'Santana' during 1977. 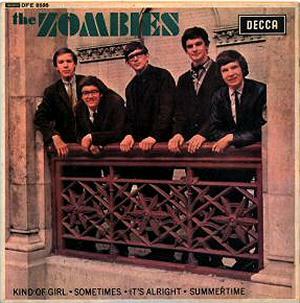 Decca DFE 8598 1965 "The Zombies"